Statutory declaration form, often called a "stat dec" for use any time you need to swear a statement of truth. Suitable for anyone, throughout New Zealand. By definition, a statutory declaration tells a unique story. There can thus be no template which provides a precise story applicable to your own situation. 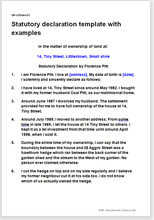 We have therefore provided as one document, three different example declarations. From the example text given, you will have some idea how to frame your own story. In particular, examples and advice are given on the opening and closing words. Note: lawyers often refer loosely to “an oath” or “swearing”. Oaths are occasionally required, but more often than not, they mean a “declaration” which is “declared” not “sworn”.